Spurs Students:The SPURS Team would like to congratulate Marcus Toney and Cassie Hernandez for being chosen as the SPURS Students of the Month for October. Marcus and Cassie are both considerate and participate regularly in class. They demonstrate an excellent work ethic. Congratulations to Marcus and Cassie! 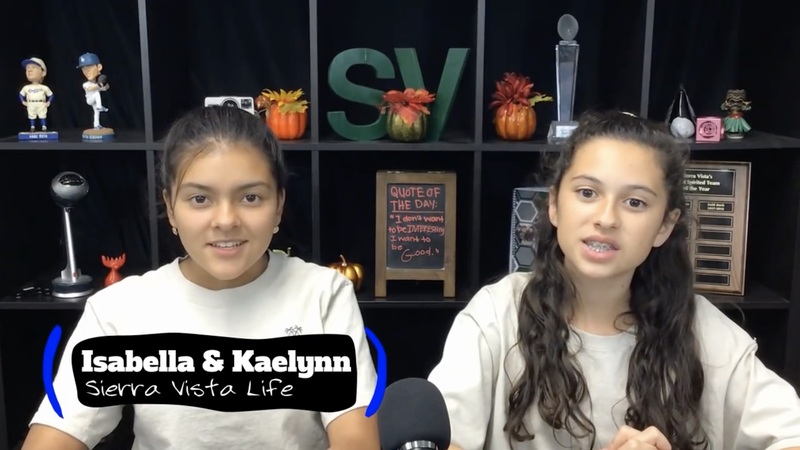 Club Survey: Hey Sierra Vista! Please fill out the Club Survey to let ASB know what clubs you would like to see at Sierra Vista. You can get the form on the Sierra Vista Website. Fun Friday: Come to the outdoor stage at lunch for fun Friday on November 9. You will be guessing what fall related items are in the box. ASB hopes to see you there. Chalk Mandala Class: Attention ALL Sierra Vista students! If you saw the chalk mandalas a few weeks ago created by art students and thought to yourself that it looked like something you would like to try, then pick up a form from Mrs. Knolls in the counseling office. There will be a chalk mandala class next Wednesday, November 14 for anyone interested in creating their own chalk mandala design. The first 20 students to turn in their form to Mrs. Knolls get to create their own mandala design next Wednesday after school from 2:15 to 3:15. No School: Please note that we do not have school on Monday for Veterans day. Clubs And Activities: Today in Clubs and Activities we have the Trading card club in room 101, the fitness club in the fitness center after school, and the turkey Bowl Tournament on the PE Fields.